Pearl is a sixteen-year-old vampire . . . fond of blood, allergic to sunlight, and mostly evil . . . until the night a sparkly unicorn stabs her through the heart with his horn. Oops. Normally I race through books trying to see when the romance between the characters will start. But not with this book. The premise of the books is so unique and enthralling that, for once, Pearl’s romance with Evan took a back seat. It also helped that Durst had these neatly placed tidbits to tide me over until the romance actually kicked in. The writing was smooth, and the pacing perfect. There were times where I worried about Pearl, and other times she just made laugh because of something she said or a situation she found herself in. Her worries, her thoughts, her interactions … her everything just fit. As a vampire who could exist in the sun due to a unicorn attack, Pearl had me convinced. Definitely a recommendation for anyone who wants to read a non-traditional vampire tale and have a good laugh while you’re at it. 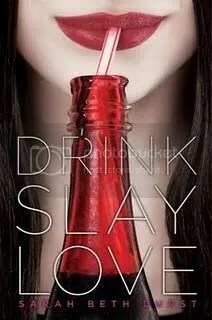 “Drink, Slay, Love” comes out on September 13, 2011. 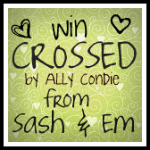 This entry was posted on Tuesday, August 16th, 2011 at 12:15 am	and tagged with drink slay love, durst, reading recommendation, sarah beth durst and posted in Review, Science Fiction/ Fantasy, YA. You can follow any responses to this entry through the RSS 2.0 feed. Sweet blog you have here. Review gives a good thumbnail of story’s attributes without a “spoiler alert”. Difference between you and me, I’d be tempted to skim through the romance to find the para in the normal. That’s me with the black heart. Can learn from your perspective. Thanks. I hate to give too many spoilers. These reviews are so that people will be interested in trying the books out themselves, hopefully. To spoil it seems silly. Romance is fun! It gives people a warm, tingly feeling of happiness and the idea that maybe things can work out okay. Or at least it does for me. I’ll check out your review when it comes out! I’m excited that so many people seem interested in this book.